In a livestream last night, Grasshopper Manufacture revealed the contents of the Travis Strikes Again: No More Heroes season pass. While the pass has been rumored since a retail listing indicated it came with the extra content, neither Nintendo nor Grasshopper have officially acknowledged it until now. The season pass includes two new episodes, one which puts players in control of Shinobu and one that inexplicably gives players control of Bad Girl. Shinobu was one of the assassins on Travis’ list from the original No More Heroes. After severing her arm, Travis spares the schoolgirl samurai, who then becomes infatuated with him. She headlines the episode Black Dandelion episode, which comes with an adventure visual novel part for Bad Man. Shinobu’s DLC episode releases on February 28. 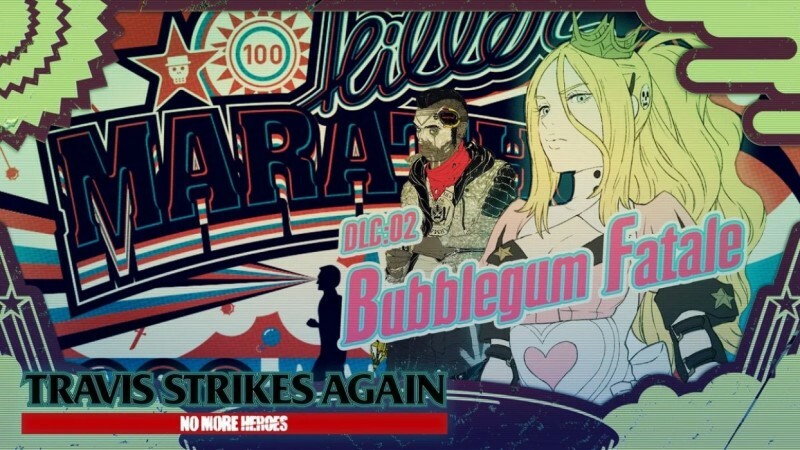 The other episode, titled Bubblegum Fatale, stars another No More Heroes assassin named Bad Girl. Her presence is curious, since Travis definitely did not spare her, and her death is actually the inciting incident for Travis Strikes Again. After learning Travis killed his daughter, Bad Man pursues him and they both get sucked into the game console. Her DLC episode will release on April 30 and will come with a visual novel section for Travis. Both packs are available with the season pass for $9.99, which is included in the cost of the retail version. The voice cast for the game has also been revealed, confirming that Robin Atkin Downes, the longtime voice actor for Travis and voice for characters like Metal Gear Solid’s Kazuhira Miller, is in fact returning. Atkin Downes had previously said he would be unable to voice Travis during the voice actor’s strike, but it appears they found a middle ground. Travis Strikes Again releases on January 18 exclusively on Nintendo Switch. You can read our latest preview of the game here and check out some footage of us playing the game right here.